The Sloth Conservation Foundation (SloCo) is a registered non-profit organisation dedicated to saving sloths in the wild through research and conservation initiatives. Based on the belief that every single person has the ability to make a positive difference, we are focused on inspiring individuals to care about sloths, to protect the rainforest ecosystem and to safeguard a future for the planet that we all share. 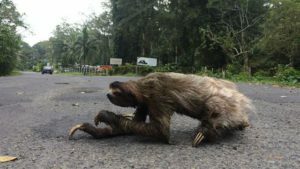 Sloth populations are in decline throughout South and Central America as they struggle to adapt to the urbanisation of the rainforest. Saving these incredible animals from extinction now requires innovative and long-term conservation solutions that provide sustainable ways for sloths to coexist with the people sharing their habitat. We have developed a range of community-based programs that help us to achieve this mission. You can make a difference. As a non-profit organisation, we rely on your support to make our work possible. There are many ways in which you can help to protect a future for sloths: commit to donate, adopt a sloth, volunteer or browse our online shop!